What's the difference between a 'night car' and a streetcar which runs at night? Toronto's regular service surface transit lines operate for roughly 18-20 hours each day, generally between 5 am and 1 am. During the four 'overnight' hours from 1 to 5, surface transit is provided on a basix matrix of routes designated the BLUE NIGHT NETWORK in TTC parlance. Thus, while streetcars are a common sight on Toronto's streets after dark, only two carlines operate during the overnight hours, 301 QUEEN and 306 CARLTON. 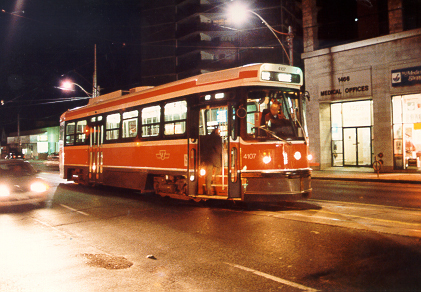 The most recent subtraction from Toronto's all-night trams was 312 ST. CLAIR, which was bussed in March, 2000. 501 QUEEN 301 QUEEN One of Toronto's two remaining night car routes in 2000. 502 DOWNTOWNER N/A Night service is provided over most of this route by routes 301, 322 and a small part of 303. 503 KINGSTON ROAD N/A Night service is provided over portions of this route by routes 301, 322 and a small part of 303. 504 KING N/A 304 KING service discontinued 2/16/92. Night service is provided over the outer ends of this route by routes 313 and 303. 505 DUNDAS N/A No night service over most of this route; its outer ends are served overnight by 303, 306 and a small portion of 313. 506 CARLTON 306 CARLTON One of Toronto's two remaining night car routes in 2000. 508 LAKE SHORE N/A Rush hour route, seven trips daily; western portion is served by 301 cars overnight. 510 SPADINA N/A No night service is provided over this route. 317 SPADINA bus service discontinued 2/16/92 (day service then provided by 77 Spadina buses). 512 ST. CLAIR 312 St. Clair Operated with streetcars until 3/19/00. Overnight service bussed, extended from Gunn's Loop to Jane Station thereafter. In days of yore, TTC provided 24-hour streetcar and bus service on a pared-down network of routes, mostly within the old City of Toronto. In 1968, two years after the opening of the crosstown Bloor-Danforth subway, Toronto's all-night transit routes comprised only the 13 lines shown in the table below (with streetcar routes in CAPITAL LETTERS). The 1980s, already distant, have nostalgically been called TTC's glory days: ridership soared, and the system's long-standing record of safe and efficient service had become the stuff of legend. Subway expansion may have come to a temporary standstill, but TTC rail operations were marked by the opening of the Scarborough Rapid Transit (ICTS) line, the addition of CLRVs and ALRVs to the streetcar fleet, and the rebuilding of A8 PCC cars. TTC's expanded night service would carry a new name--the BLUE NIGHT NETWORK--with blue-themed accoutrements to accent its identity: 300 series BLUE NIGHT route numbers, reflective blue bands on car and bus stop signs, and distinctive blue destination sign exposures. In addition a separate map and timetable booklet showing all night route schedules was provided to patrons. TTC added, subtracted and modified BLUE NIGHT ROUTES as the need arose throughout the 1980s and '90s. Also during the '90s, the BLUE NIGHT NETWORK system map was added to the TTC's comprehensive RIDE GUIDE. Previously, night routes had not been displayed on TTC's system maps, but were listed by name only. 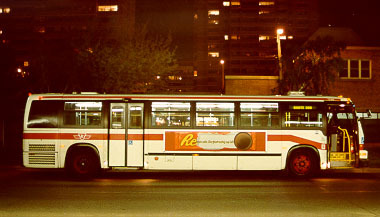 The recession years of the late 1980s/early '90s resulted in service cutbacks at TTC, and several night routes fell under the axe. The 304 KING night car, with its low ridership, was eliminated during this period, ostensibly due to its low ridership. No replacement bus was provided, as the outer portions of the route were served by buses, and the long mid-section was closely paralleled by the 301 QUEEN cars. That said, night service has expanded overall between 1987 and 2000; today, 20 routes serve Toronto's all-night commuters on a network covering the length and breadth of Metro Toronto (although only two are operated by trams). Most operate on half hourly headways, although the 300 Bloor-Danforth and 320 Yonge buses, which replace the subway lines overnight, operate on 15 minute headways.